> What do I do when I’m bullied? Bullying is a serious issue, whether a child is being bullied, doing the bullying, or witnessing bullying as a bystander. Providing simple steps for young children to follow in the event that they are bullied is imperative to their social/emotional development. By following the "Freda Stops a Bully" lesson in the Teacher Lesson Card, which incorporates the corresponding story book, animation, story sort and activities, your students will learn how to deal with this situation in an appropriately positive manner. In the story, Max teases Freda about her new pink shoes. When she asks her mom, teacher, and friends for help, Freda learns 4 easy-to-remember steps for What to do about a bully. By the end of the story, Freda and her new friend Max have found something they have in common! 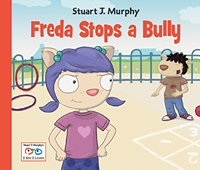 The 3-part lesson helps children take a closer look at the steps Freda took to stop a Bully. Children practice and learn the emotional skills they need to deal with bullying. Includes animations, story sorts and activities reinforcing the 4 steps to stopping a bully that were introduced in the story. The Freda Stops a Bully Poster visually illustrates the 4 steps for What to do about a bully.